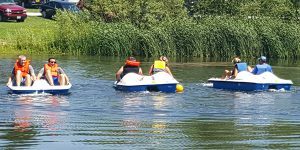 Quester employees braved the 90+ degree temperature to participate in the Easter Seals Iowa Sunnyside Regatta at Lake Cheerio. Regatta is a paddleboat race around Lake Cheerio at Camp Sunnyside. Teams consist of a captain and co-captain in each paddleboat. Company cheering squads are welcome and encouraged. The Quester team had a great time and finished a strong and noble 3rd place quarter-final finish.